Clear IAS Android App Crosses 50,000 downloads! Clear IAS android app, which was launched on June 8, 2014, has been downloaded over 50,000 times from the Google Play store. We are happy that a lot of aspirants across India (and those who prepare from outside India) found us good without any big promotion campaigns. It was just mouth publicity and lot of positive reviews in Google Play store, which made Clear IAS, a popular choice for UPSC aspirants, within a short time. 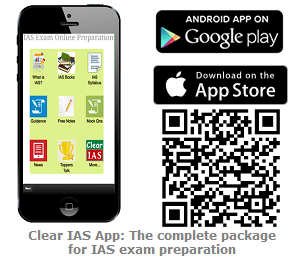 The free-to-download app helps aspirants extend their IAS Preparation from laptop to mobile and tablets. 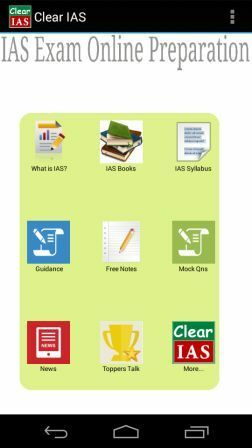 How to download Clear IAS App? Click to download Clear IAS android app from Google Play Store. Click to download Clear IAS app iPhone app from App Store on Apple iTunes. Update: The Clear IAS android app has crossed 1,00,000+ downloads on 27-06-2015. ✓ Access our UPSC study-materials from the comfort of your mobile or tablet, for free. ✓ Tips, strategies and study plan to clear all stages of IAS exam. ✓ UPSC syllabus for Prelims, Mains and Interview now at your finger tips. ✓ Get all latest posts and updates from www.clearias.com. ✓ Mobile-friendly layout and fonts to avoid eye strain. ✓ News updates from almost all leading newspapers. ✓ UPSC Toppers Interview and preparation strategies. ✓ IAS mock tests for Prelims and Mains. ✓ Updated links to buy useful IAS books online. ✓ Study-materials, free subscription options, ratings and more. The app received top ratings from our satisfied users, mostly 5 stars! Not many apps in the market, provide all the features like Clear IAS, including study materials and online tests for free. Clear IAS app was ranked in the top 5 new apps under education category in the Google Play store. Yourstory.in has mentioned about Clear IAS, in a teacher’s day article on online test preparation start-ups being built from India. Last but not least, Clear IAS Facebook page has been growing fast, and it has crossed 2 lakh followers. Download links for Clear IAS Mobile App? Scan Clear IAS QR code using any QR code reader app in your mobile: Install Android App fast! Android users who have access to Google Play store: As mentioned above, android users who have access to Google Play store can directly download the app from the Clear IAS mobile application download link. Alternatively they can also search using the keyword “clearias” in the search box at Google Play for apps. Android users who don’t have access to Google Play store: Those android users who do not access have to Google Play store can install it as a native app from other markets, where our app is available. Please note that you may need to enable third-party app installation in the ‘settings’ of your device. iOS users: Yes, we have our iPhone App ready (Update April 8, 2015): Click to download Clear IAS app on App Store on Apple iTunes. Other smartphone users like Blackberry or Windows: Till the corresponding version is available, you may use our HTML5 version from the link http://h.theapp.mobi/clearias. PS : Please don’t forget to add your reviews and comments here, as well as in Google Play store. Thanks! plz launch an app for iphone/pad. How about for ios too? I expect earlier for the iOS version clearias app. That also need to be accessible from iPhone and iPad.